I saw this recipe on Joy’s amazing food blog, and I knew I had to make it. We do, rarely, buy bananas now if the store has fair trade one in and Nora asks for them as we walk by. Before we left for Texas, I had a few extra that I froze, and this milkshake put them to perfect use. Chris asked me how I adapted it from Joy’s original and this is what I told him: I increased (almost doubled) all of the ingredients except the milk and honey, and simplified the directions. Our smoothie was the perfect level of thickness so I can’t imagine hers with twice the milk to other ingredients. None the less, I love Joy’s blog, so if you have a few minutes go check it out. 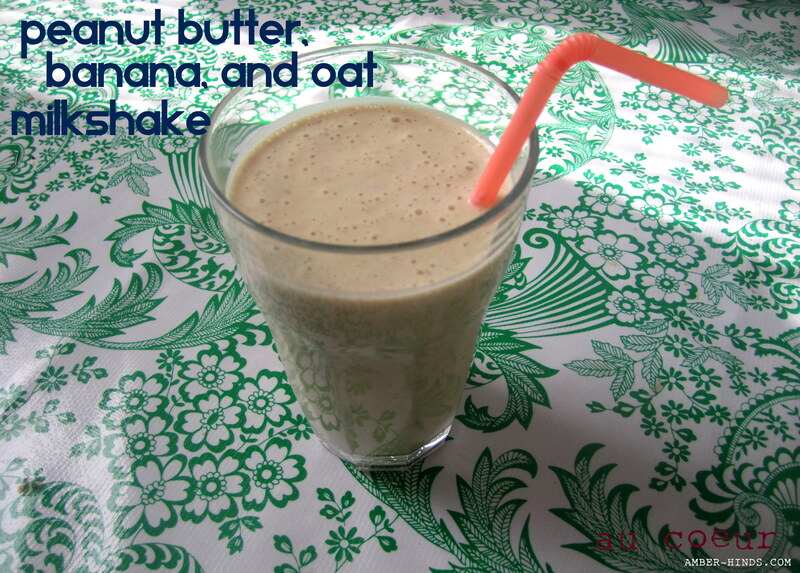 And then go make this healthy milkshake, right now. You won’t be sorry. It’s the perfect addiction for all those healthy eating New Year’s resolutions. In a blender, combine all ingredients, making sure to add milk first for easy blending. Blend until no chunks remain and mixture to completely incorporated. Pour into glasses and enjoy. Makes 4 cups — in our house 2 big and 1 small portions. This looks delicious! I am going to go freeze a banana right now :). This is likely a stupid question… but can I use oats from regular oatmeal (not the quick stuff)? Yes, I just used regular rolled oats. Since it’s not being cooked, I don’t think it matters what kind.